Here's a touching story about some stray dogs in Afghanistan valiantly assisting the Georgia National Guard unit that adopted them. This article is about a service dog in the making. The Belgian Malinois is a breed of Shepherd that is becoming quite popular for various law enforcement applications, including tracking missing people. P.S.--After I posted the blog yesterday, we caught this action from the little roll. Elvis coaxed Suki into playing with him! This is a great step for Suki, who hadn't busted out the moves until yesterday. Go Suki! The American Cancer Society is having an event in Wright Park this August called the Bark for Life. This is a Relay for Life event where pets are invited and encouraged! 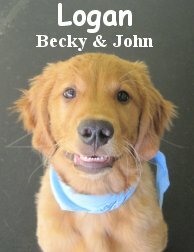 If you are interested in going and supporting cancer research, check out their website to learn about registering your dog. It should be a lot of fun, and it supports a great cause. Curious to see how cats and dogs measure up? Check out this neat science article. Here's a clip from the Fort today-- Basset Hound Abner and Akita Kyoshi may not look like they would be best buds, but they hit it off today. Truman and Osbourne were also up to their usual tricks. Here's hoping the summery weather comes back! I noticed a lot of dogs playing with others of the same breed today. First off we have Abby and Gemma, who are both Goldendoodles (don't let Abby's dark color fool you!). Next I spotted a big group of Labs all playing--Pepper, Truman, Buddy, and Osbourne. Truman and Osbourne are best-buddies whenever they are here together. Those two tear it up all day long! Compared to all the smaller guys, these two Great Danes look a bit like "Clash of the Titans." Athena and Bella had a great time together this morning. Yesterday, my Father and I were debating how dogs sometimes look like and imitate their owners. It can be wildly funny and we see it often. Guess what pops up today? An article about this very phenomenon, go figure! Check it out, Dogs automatically imitate people. I also found another article, Dog Intelligence: Amazing Stories Speak for Themselves. Cool beans! Double trouble here in the Big Roll :) ! Too funny, two sets of Yellow Lab / Black Lab buddies going at it at once (Pepper & Ryker, Truman & Buddy). McGee the Boxer gets in the mix as well! Next we have Koji and Abby having a stupendous romp around, opposites attract! Dogs go to the pubs... Why not serve them? On Saturdays dogs often get to play with guys from the other play areas. This morning Koji (who usually rolls with the medium side) gave Guinness (who is definitely a big dog) a run for his money! He even jumped up on the crates to give Guinness a little tease. Because there weren't too many small guys today either, Charlie got to go in with the medium dogs. He may seem tiny, but this Japanese Chin packs a pretty hefty punch! Here he is playing with Logan, a Golden Retriever puppy. Charlie is quite expert at using his size to his advantage, and dodging between his playmate's legs. Have a great weekend and enjoy that sunshine! Rylee had her assessment today. She is an awfully adorable, 32 pound, three and a half month young, German Shepherd. Rylee has a sweet and low key disposition (at least on this first day :), she wasn't sure what to think about the fort and all it's canine compadres... However, she didn't do half bad in the Medium Roll. As most of you know, first doggie daycare days can be a bit overwhelming, especially for a young pup. 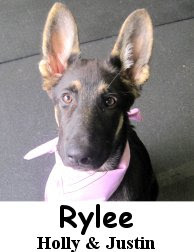 With some consistency, we believe Rylee will become a social butterfly in no time. Have a great weekend, it's gonna be nice! P.S. I'll leave you with this cool clip of today's rowdy bunch (Kyoshi, McGee, Osbourne, Pawsha & Truman)! One of our customers just picked up their new precious pets... Can you say CUTE!? I knew you could! These two Wirehaired Dachsunds aren't quite old enough to attend but in a month or two they will be. How exciting, the Little Roll can't wait! P.S. 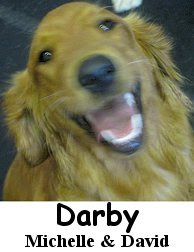 A while ago Darby had her first day and I misplaced the camera. I got the pic now, what a looker! Bella had her assessment this morning. 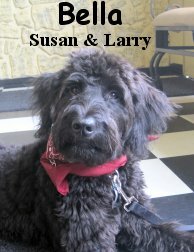 She is a wonderful, 30 pound, six month old, Black Goldendoodle. Bella did absolutely marvelous. She is very social, frolicking and romping with the best of the Medium Roll. Great job Bella, we'll see you again soon! P.S. Here are a couple of articles found today that I'd like to pass on, Oil spill refugee dogs and Pet Travel: Airlines with the most dog deaths. Not the happiest reading but good info none the less. I was emailed this funny photo last night, "Dog CPR" Hahahaha! Found this link last night on King5 News... We hear about this kind of thing all the time. I think a few folks jump the gun on people but for the most part they are right. Hot cars and dogs don't mix! Today was pretty exciting here at the Fort. Koji played his favorite chase game with Sarah and Seamus this morning. He just loves to get everybody chasing him! Next we have Chloe and Lillie tearing it up! P.S.--The supposed Chupacabra that was found last week has been genetically tested and it turns out that it isn't anything other than a coyote-dog hybrid. Found this on CNN last night and thought I'd share it. Deborah is quite an amazing gal, you go girl! Logan is a friendly guy that had his assessment this morning. Logan's a four month old, 40 pound Golden Retriever. I'd say he is a typical Golden and that is a good thing! Logan is happy go lucky, he made doggie friends easily and is very playful. He'll be a great addition to the Medium Roll, although he may go to the Big Roll as he grows, he could turn into a pretty good sized dog! Nice job today Logan. Pet trapped in hot car beeps until he is saved - One lucky puppy there! Dogs in Kabul take on dangerous role in war - Not sure how I feel about this one but at least the dogs seem to have a better track record then the people in the same position... Go figure lol, the nose knows! P.S. I found this neat snippet the other day, it talks about why dogs bark, it may be of interest to you. It's starting to heat up, and summer safety for pets is becoming more and more important. A dog in Maryland has died after being left for too long in a hot car. Cars are especially dangerous places for both pets and people in the heat. Even after just ten minutes, a dog that is trapped in a sweltering vehicle can start to go into distress. The best thing you can do if you have to run errands, is to leave your dog someplace safe, or to go places where you can bring them with you. Make sure while you're out and about that your pets are getting enough water. This can be hard to think of when they appear to be taking care of themselves. Whenever you go to have a drink of water, make sure your pet gets one too. The Tacoma News Tribune had some great tips on beating the heat. The Seattle Times has a neat article tailored specifically to pet safety in the hot weather. You can watch a clip from a Canadian News Program about dogs and the heat. In other news, a Tacoma man entered the Beneful Ultimate Dog Park contest, you can see his video entry here. If he gets chosen as a finalist, he could win $500,000 of funding for his envisioned upgrades the the off leash areas at Point Defiance Park. Make sure that you head on over and vote! 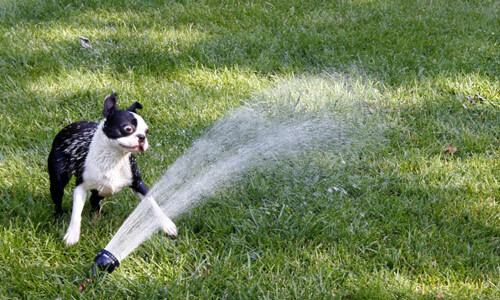 PS--Here are some funny pictures of dogs and sprinklers that I found. Too cute! I bring you today's post with much sadness. One of The Fort's very first pals has passed away. Omar was a sharp looking, 12 year old, Dalmatian that always surprised us! Despite his severe arthritis, he would come through our doors excited and ready to play. Omar would often be seen frolicking with dogs a quarter of his age, he had a tremendous spirit right up until his last days. 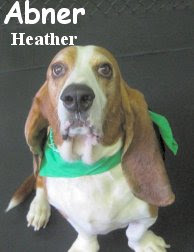 He was also a lucky dog, rescued by a loving couple that provided for him wholeheartedly. Take care Mr. Omar, see you on the other side of the Rainbow Bridge. Elphie had her assessment this morning. She is a one year old, 12 pound, Dachshund mix. 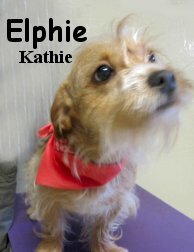 Elphie is a wonderful little dog that did super upstairs in the little roll. She has been to daycare before so she's already all about it. Elphie made friends instantly, her favortie pal was Fendi. Score! Bailey Magoo had his assessment this morning. 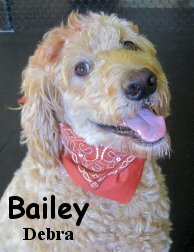 He is a swell looking four year old, 95 pound, Goldendoodle. Bailey hung out in the Big Roll and did fairly well. We plan on seeing more of Mr. Magoo! Gracie Anne's Mom Sylvia sent us in a couple of great 4th of July photos. They show Gracie Anne (a black Miniature Poodle) and her buddy Annabelle (a Chihuahua mix) looking quite festive. Thanks Sylvia! I hope everyone had a great Holiday weekend! Just wanted to make a quick note about the heat wave that seems to be on it's way... Be sure to keep yourself and your pets hydrated and cool. Living in the NW, this kinda thing (61 to 80 degrees all of a sudden) can catch us off guard. On hot days at the fort, each play area has fans and extra H2o ready to go. We also fill kiddie pools with ice towards the hottest part of the day, the dogs absolutely love this. It's fun to watch them jump in and out of the pools, hopefully I can get some clips of their antics. Luckily we stay fairly cool in this big warehouse. You can rest assured that we'll be keeping your pooch safe, hydrated and comfortable. P.S. I like this neat DIY Ice Treat! I may try that this season, last year, frozen water balloons (with the balloon part taken off after the freeze) worked great as an ice ball/toy. Gem and Kona were tearing it up all day long! Kona is the Labradoodle, and Gem is a Bernese Moutain Dog puppy. The Tacoma-Pierce County Humane Society is going to be at the Freedom Fair tomorrow. You can stop by their booth and get all kinds of information about adopting a new family member, or taking care of the ones you already have. If you're looking for something fun to do next weekend, and don't mind a bit of a trip, you could check out Doggapalooza in Renton. There are going to be all kinds of kid-friendly activities, and a Dog/Owner look-alike contest! Sounds like a lot of fun. This was part of an email my Aunt sent me this morning, thought I'd share it. Being a veterinarian, I had been called to examine a ten-year-old Irish Wolfhound named Belker. The dog's owners, Ron , his wife Lisa , and their little boy Shane , were all very attached to Belker, and they were hoping for a miracle. The next day, I felt the familiar catch in my throat as Belker?s family surrounded him. Shane seemed so calm, petting the old dog for the last time, that I wondered if he understood what was going on. Within a few minutes, Belker slipped peacefully away. Have a safe and spectacular 4th of July! You can always bring your pooch into the fort on Saturday to get a little "P and V" out of them before the festivities begin. We are open for business on Monday July 5th as well. P.S. O yeah... There is a new Word's Ugliest Dog, I guess congratulations are in order? Hahaha!